It’s slated to be the largest development in the city. 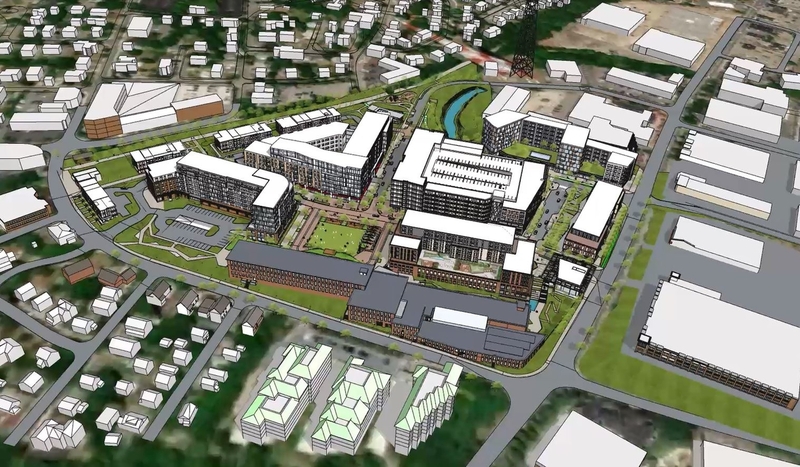 NEWTON, MA — If all goes to plan, Northland Investment Corporation, a Newton-based developer will built the largest multi-use development that Newton has seen in a very long time. The latest plans are slated to come before the City Council’s Land Use Committee Tuesday, which is the next step in the years-long process that still needs to go through a rezoning approval process, too. As Northland Investment Corporation moves forward to redevelop the mill as part of a 22.6-acre mixed-use project, company officials have been working on the three main concerns residents have surrounding the project: transportation, traffic and schools. Northland is due to make a full presentation on their project Tuesday night to the City Council’s Land Use Committee during a meeting on their special permit application. Since Northland Investment Corp. unveiled plans for a 1.4-million-square-foot redevelopment in 2016, the developer had held more than 100 meetings with neighbors and officials according to Peter Standish, senior vice president of Northland. And, he said they’ve taken the three main concerns to heart and lowered the number of units, keeping most of them with fewer bedrooms, lowered the number of parking spaces and added more than 1,000 spaces to store bikes, formed a public transportation plan complete with shuttle and transportation hub where folks can catch said shuttle to commuter rails nearby. They’ll also have several green spaces, a park and the plan is to connect the Upper Falls Greenway to a bike path that will take users safely through the development and on their way across Needham Street and connect them to the other side. It’s to really encourage other modes of transportation,” said Standish who lives in Newton. The Newton Upper Falls project proposes 13 buildings varying in height from 3 to 8 stories with a total of 822 housing units (123 of which will be affordable), 193,200 square feet of office space and 237,097 square feet of commercial space on a 22.6 acre site. The 172,000-square-foot former Clarks Americas shoe company offices would be expanded into 372,000 square feet of commercial space, according to documents submitted to state environmental regulators. The development site consists of several parcels at Oak and Needham Streets acquired by Northland over the past decade, including the Oak Street converted mill complex. Clarks relocated to a build-to-suit headquarters at a former Polaroid building on Main Street in Waltham. Retail and restaurant space would be built in a Main Street format with a park in the center of the site, with residences on the upper floors of businesses. Northland said its approach supports the Newton-Needham (N-Squared) Innovation District’s goals of boosting suburban job creation. The program is a partnership between the two communities, Newton-Needham Regional Chamber and local businesses with the goal of to revitalizing 500 acres of commercial properties near Route 128.